After obtaining a Kriging result in the current iteration, the next step is to compare it with a Kriging result from the previous iteration (see the overall workflow). Remember that the difference between the current iteration and the previous one is the current sample set, which is contained in the current iteration but not in the previous one. To compare with a previous Kriging result, click the 'Compare to previous Kriging result' menu item under the 'Geoprocessing' menu. In the popped-up dialog, first select a previous iteration (i.e. a sample set combination) in the top drop-down list, then select a dose version for the iteration (i.e. a combination of dose versions for all contained sample sets) in the bottom drop-down list. After clicking the 'OK' button, the previous Kriging result will also be loaded onto the map, and the 'Comparison' pane will appear in the bottom-right control (see the following figure). 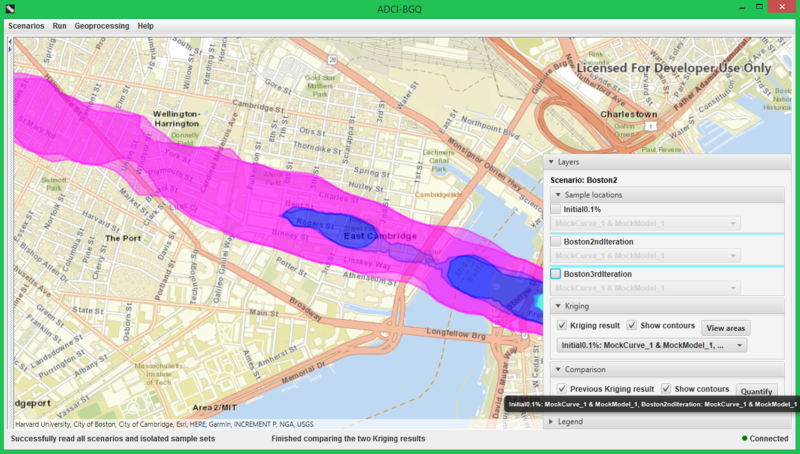 Similar to the 'Kriging' pane, the two checkboxes 'Previous Kriging result' and 'Show contours' in the 'Comparison' pane respectively control whether the filled regions and region contours of the previous Kriging result are displayed on the map. 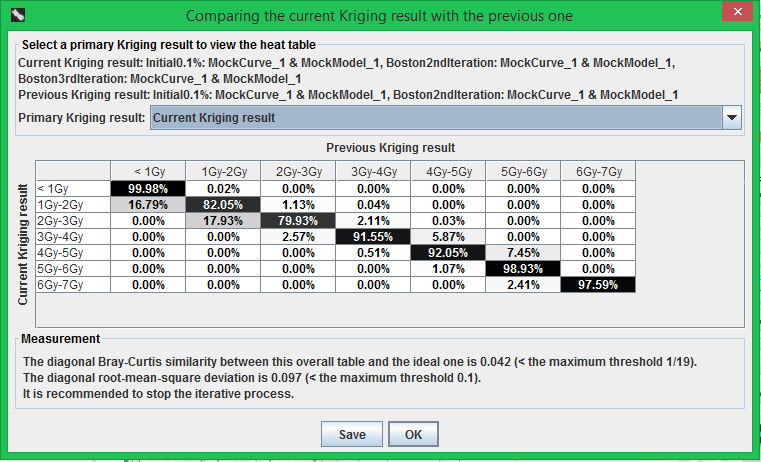 When you hover the mouse cursor over the ''Previous Kriging result' checkbox, a tooltip will appear showing which previous Kriging result is being compared. The overlap between the current and previous Kriging result on the map provides an intuitive, qualitative comparison between them. 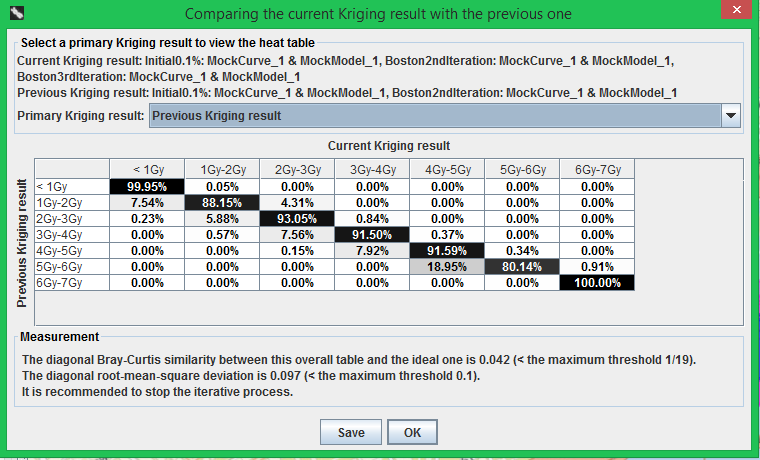 ADCI-BGQ also allows quantitative comparison via heat tables to determine whether the two results are close enough and the iterative process can stop (see the overall workflow), which can be achieved by clicking the 'Quantify' button. The following figures show the popped-up dialog. The top grouping box indicates which two Kriging results of the scenario are being compared. The heat table in the middle of the dialog is generated in the the following way. Each row is a region with a particular dose range in the first Kriging result (called the primary result). Each column is a region with a particular dose range in the other Kriging result. For each region in the primary result, the percentage of the area of the overlap between it and each region in the other result accounting for its own area is determined and filled into the corresponding cell of the table. Thus the percentages in each row sum to 1. Either the current Kriging result or the old one can be treated as the primary result, resulting in two heat tables. Then there is an overall table, which is the average of the two tables. Using the drop-down list you can select change the table currently being displayed. The ideal situation for stopping the iteration process is that the two Kriging results are identical, implying that all diagonal values of each table are 1 and all other values are 0. Thus two values, Bray-Curtis distance and Root-mean-square deviation (RBSD), are computed between the diagonal of the overall heat table and the diagonal of the ideal table. These two values are shown in the bottom label, and ADCI-BGQ gives a suggestion based on these two values about whether to stop/continue the iterative process. The criterion to stop the iteration is computed from the following case, which is also described in the tooltip shown when the mouse cursor hovers over the bottom label: in the overall table, every diagonal value is 90% (i.e. the area of the overlap between each region in the current Kriging result and the corresponding region in the previous result accounts for 90% of the area of either region). In this case, the diagonal Bray-Curtis distance is 1/19, which is a maximum threshold; the RBSD is 0.1, which is also a maximum threshold. As long as one of these two statistical values meets the threshold, then the software recommends to stop the iteration. You can save these three tables to your local computer by clicking the 'Save' button.